A blast of the brightest X-rays ever detected from beyond our Milky Way galaxy's neighborhood temporarily blinded the X-ray eye on NASA's Swift space observatory earlier this summer, astronomers now report. The X-rays traveled through space for 5-billion years before slamming into and overwhelming Swift's X-ray Telescope on 21 June. The blindingly bright blast came from a gamma-ray burst, a violent eruption of energy from the explosion of a massive star morphing into a new black hole. "This gamma-ray burst is by far the brightest light source ever seen in X-ray wavelengths at cosmological distances," said David Burrows, senior scientist and professor of astronomy and astrophysics at Penn State University and the lead scientist for Swift's X-ray Telescope (XRT). Although the Swift satellite was designed specifically to study gamma-ray bursts, the instrument was not designed to handle an X-ray blast this bright. "The intensity of these X-rays was unexpected and unprecedented" said Neil Gehrels, Swift's principal investigator at NASA's Goddard Space Flight Center. He said the burst, named GRB 100621A, is the brightest X-ray source that Swift has detected since the observatory began X-ray observation in early 2005. "Just when we were beginning to think that we had seen everything that gamma-ray bursts could throw at us, this burst came along to challenge our assumptions about how powerful their X-ray emissions can be," Gehrels said. "The burst was so bright when it first erupted that our data-analysis software shut down," said Phil Evans, a postdoctoral research assistant at the University of Leicester in the United Kingdom who wrote parts of Swift's X-ray-analysis software. "So many photons were bombarding the detector each second that it just couldn't count them quickly enough. It was like trying to use a rain gauge and a bucket to measure the flow rate of a tsunami." The software soon resumed capturing the evolution of the burst over time, and Evans recovered the data that Swift had detected during the software's brief shutdown. The scientists then were able to measure the blast's X-ray brightness at 143,000 X-ray photons per second during its fleeting period of greatest brightness, which is more that 140 times brighter than the brightest continuous X-ray source in the sky — a neutron star that is more than 500,000 times closer to Earth than the gamma-ray burst, and that sends a 'mere' 10,000 photons per second streaming toward Swift's telescopes. Gamma-ray bursts typically begin with a bright flash of high-energy gamma-rays and X-rays, then fade away like a fireworks display, sometimes leaving behind a disappearing afterglow in less-energetic wavelengths, including optical and ultraviolet. Surprisingly, although the energy from this burst was the brightest ever in X-rays, it was merely ordinary in optical and ultraviolet wavelengths. The Swift scientists were able to estimate the overall brightness of GRB 100621A by sampling the photons at some distance from its overexposed center — a standard correction technique. Scientists who study the Sun use a similar approach to observe the Sun's corona by blocking out its much-brighter center. "With this burst, we had to sample the photons twice as far from the center as we ever had to go before," Burrows said. 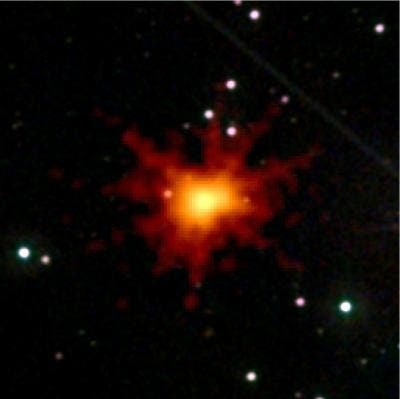 "The correction factor for the X-rays from GRB 100621A was 168 times larger than for a typical gamma-ray burst and 5 times larger than for the brightest burst we previously had seen. We never thought we'd see anything this bright." Automated analysis of the Swift XRT data is performed at the University of Leicester in the United Kingdom, which has been studying X-rays from outer space for the past half century. Evans was the first to see the processed data from the burst's initial blast. "When I first saw the strange data from this burst, I knew that I had discovered something extraordinary," he said. "It was an indescribable feeling when I realized, at that moment, that I was the only person in the whole universe who knew that this extraordinary event had occurred. Now, after our analysis of the data, we know that this burst is one for the record books."